When I was a kid, I lived just outside a small Pennsylvania borough called Danville. 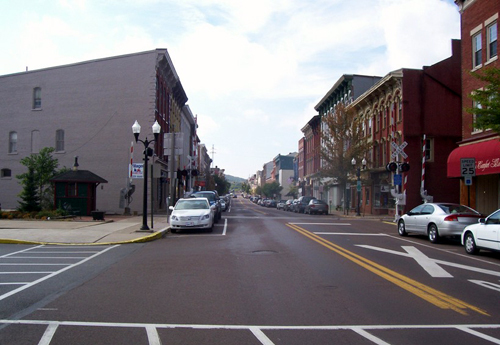 (I just realized that I can’t officially call it a “town,” because nearby Bloomsburg always claimed to be “the only town in Pennsylvania.”) It was a great place to live! It seems we are all shaped by the times and places we remember while growing up, to the point that some of them become almost synonymous with childhood. One of the things that was like that for me was a store in downtown Danville called McWilliams. Mill Street in downtown Danville. If you walk a few blocks down the road, McWilliams will be on your left. McWilliams was an eclectic combination of different things that seems a bit odd now. At ground level, part of it was a drug store, while the rest of it was more of a bookstore (but a very small one). But the best part was downstairs in the basement– the movie and video game rental section. The walls were lined with empty videotape and game boxes, and if you brought one to the counter upstairs, they would give you the movie or game (along with instruction book) in a clear plastic container. I think the cost of a rental went from $0.99 to $1.99 during the time I lived in Danville. The best occasions came at the end of a semester or year in school. If you brought your report card and had good grades (I think it had to be B’s or better), you could rent a game for free. My brothers and I would each pick out a game, and we’d have a fun weekend trying to beat them. That’s how I first discovered a great many of the NES games on my list of favorites. When I got older and started collecting games for myself, I was surprised to discover that at least one of the games they had was actually quite rare, and it had been a neat privilege to be able to play it whenever I wanted. It’s not worse the way it is now; it’s just different, and it somehow makes my memories of trips to McWilliams more special to realize that it couldn’t happen that way today. At the time, though, it seemed like the most normal thing in the world. I don’t know if this sort of memory ends up being boring to share; it might be if your experiences aren’t similar. What memories of childhood are uniquely part of you because of where you lived?